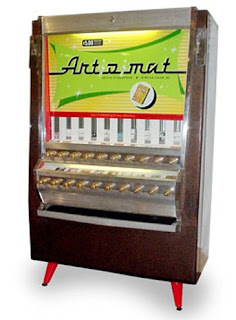 I heard about the Art-o-Mat project several years ago. Basically artists submit cigarette pack sized art following certain specifications and these are sold through retro-fitted Art-o-mat Machines. Art-o-mat machines are retired cigarette vending machines that have been converted to vend art. At last count there are 82 active machines in various locations throughout the USA. There are over 400 artists involved in the project. I am dying to get one of these over here in Japan. Or do something similar here. The idea is to make art an everyday thing. Make art fun, affordable, and give artists an easy way to get their ideas out into the world. Another great art idea is ATCs or Artist Trading Cards. Lots of these are being made, traded and/or sold on swap-bot, and etsy.com. I've even made and traded a few myself. ATCs are basically playing card sized bits of art, often created and traded around a theme. You can read about making them and the idea behind the process here and here. Interested in participating? There is a great ATC community at ATCs for All. I am thinking of making some progressive and GNB ATCs to give away in Denver. Check out more ATC samples at the Illustrated ATCs Gallery. There are also tons of people doing photo based ATCs which is also a great way to share your camera lens view of the world. But at the end of the day, all these miniature art movements are about access, distribution and a cultural sharing of ideas that is fun and not intimidating.